The first robot rover to land on the Moon in nearly 40 years, China’s Jade Rabbit, has begun sending back photos, with shots of its lunar lander. 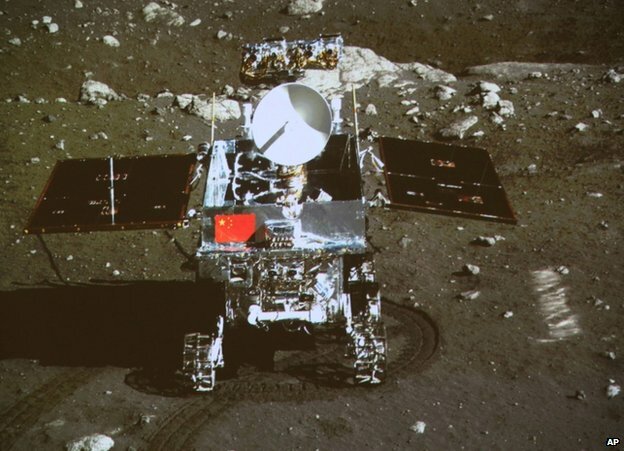 Jade Rabbit rolled down a ramp lowered by the lander and on to the volcanic plain known as Sinus Iridum at 04:35 Beijing time on Saturday (20:35 GMT). It moved to a spot a few metres away, its historic short journey recorded by the lander. On Sunday evening the two machines began photographing each other. A Chinese flag is clearly visible on the Jade Rabbit as it stands deployed on the Moon’s surface. Ma Xingrui, chief commander of China’s lunar programme, declared the mission a “complete success”. The first soft landing on the Moon since 1976 is the latest step in China’s ambitious space programme, says BBC science reporter Paul Rincon. The lander will operate there for a year, while the rover is expected to work for some three months. The Chang’e-3 mission landed some 12 days after being launched atop a Chinese-developed Long March 3B rocket from Xichang in the country’s south. Scientists from around the world are gathered this week at NASA’s Ames Research Center in Moffett Field, Calif., for the second Kepler Science Conference, where they will discuss the latest findings resulting from the analysis of Kepler Space Telescope data. Included in these findings is the discovery of 833 new candidate planets, which will be announced today by the Kepler team. Ten of these candidates are less than twice the size of Earth and orbit in their sun’s habitable zone, which is defined as the range of distance from a star where the surface temperature of an orbiting planet may be suitable for liquid water. At this conference two years ago, the Kepler team announced its first confirmed habitable zone planet, Kepler-22b. Since then, four more habitable zone candidates have been confirmed, including two in a single system. New Kepler data analysis and research also show that most stars in our galaxy have at least one planet. This suggests that the majority of stars in the night sky may be home to planetary systems, perhaps some like our solar system. From the first three years of Kepler data, more than 3,500 potential worlds have emerged. Since the last update in January, the number of planet candidates identified by Kepler increased by 29 percent and now totals 3,538. Analysis led by Jason Rowe, research scientist at the SETI Institute in Mountain View, Calif., determined that the largest increase of 78 percent was found in the category of Earth-sized planets, based on observations conducted from May 2009 to March 2012. Rowe’s findings support the observed trend that smaller planets are more common. 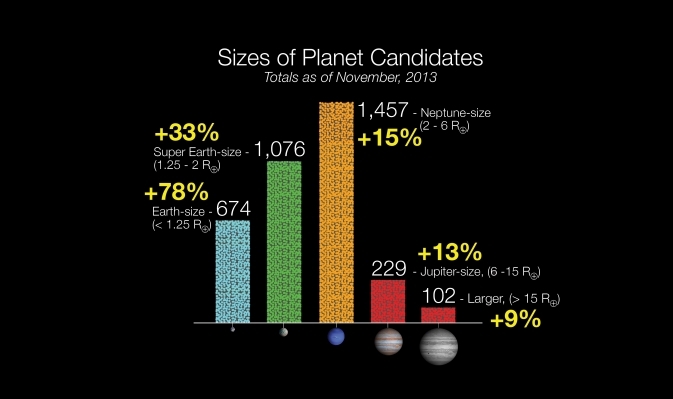 The number of observed exoplanets - worlds circling distant stars - has passed 1,000. 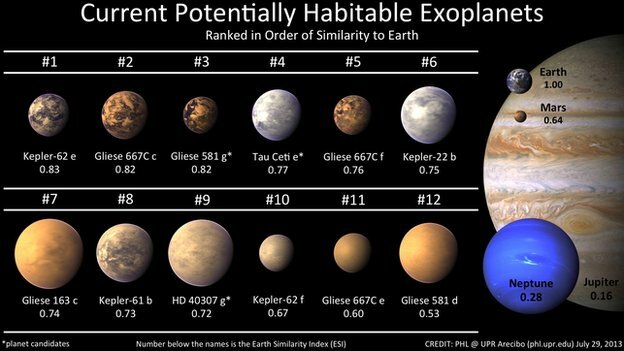 Of these, 12 could be habitable - orbiting at a distance where it is neither “too hot” nor “too cold” for water to be liquid on the surface. The planets are given away by tiny dips in light as they pass in front of their stars or through gravitational “tugs” on the star from an orbiting world. These new worlds are listed in the Extrasolar Planets Encyclopaedia. The tally now stands at 1,010 new exoplanets, bolstered by 11 new finds from the UK’s Wide Angle Search for Planets (Wasp). Abel Mendez of the Planetary Habitability Laboratory at the University of Puerto Rico, said that although the number has rapidly increased in recent years, due to a lack of funding this figure is much lower than it could be. “We have more techniques and proven technology to detect more exoplanets, but the limit has been telescopes, especially space telescopes. The new Cygnus freighter has arrived at the International Space Station (ISS) carrying about 700kg (1,500lb) of food and other supplies. Astronauts on the platform reached out with a robotic arm and grabbed the vessel at 11:00 GMT. 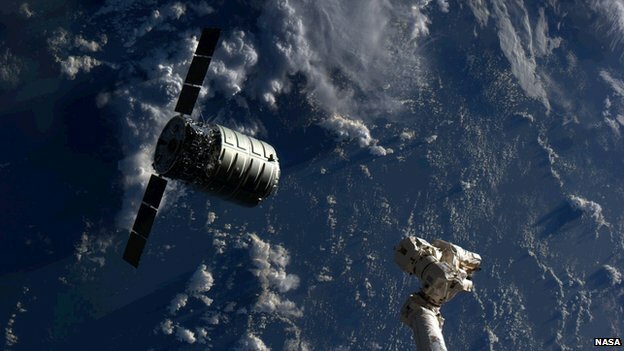 Cygnus is on a demonstration mission to prove its technology. It is one of two commercial ventures seeded by Nasa to pick up America’s ISS re-supply requirements following the retirement of the space shuttles. The new vehicle, developed by the Orbital Sciences Corporation (OSC), made its approach using a mix of GPS, inertial navigation and lidar. It parked itself a little over 10m under the station, within reach of the Canadarm2. Operated by astronauts Italian Luca Parmitano and American Karen Nyberg, the robotic limb then grappled the freighter, pulling it into the ISS’s Harmony module. Capture - the securing of bolts mating Cygnus to Harmony - occurred at 1244 GMT, when the ISS was moving over the Indian Ocean. Future Mars explorers may be able to get all the water they need out of the red dirt beneath their boots, a new study suggests. NASA’s Mars rover Curiosity has found that surface soil on the Red Planet contains about 2 percent water by weight. That means astronaut pioneers could extract roughly 2 pints (1 liter) of water out of every cubic foot (0.03 cubic meters) of Martian dirt they dig up, said study lead author Laurie Leshin, of Rensselaer Polytechnic Institute in Troy, N.Y. Curiosity touched down inside Mars’ huge Gale Crater in August 2012, kicking off a planned two-year surface mission to determine if the Red Planet could ever have supported microbial life. It achieved that goal in March, when it found that a spot near its landing site called Yellowknife Bay was indeed habitable billions of years ago. But Curiosity did quite a bit of science work before getting to Yellowknife Bay. Leshin and her colleagues looked at the results of Curiosity’s first extensive Mars soil analyses, which the 1-ton rover performed on dirt that it scooped up at a sandy site called Rocknest in November 2012. Using its Sample Analysis at Mars instrument, or SAM, Curiosity heated this dirt to a temperature of 1,535 degrees Fahrenheit (835 degrees Celsius), and then identified the gases that boiled off. SAM saw significant amounts of carbon dioxide, oxygen and sulfur compounds — and lots of water on Mars.